It's good to know that..
Every whirlpool bath that we build is produced by our expert team of whirlpool fitters. 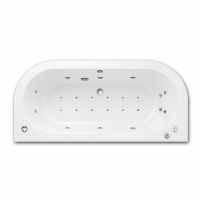 We strive to give you the best bathing experience, at the lowest possible price. We only use the most advanced whirlpool parts, sourced from Europe, which are manufactured to the highest quality. Every one of our baths is run through a strict quality control procedure, to ensure it reaches you in perfect condition and also allows us to offer a one-year guarantee on ALL our whirlpool systems. We also endeavour to meet all your requirements when building your bath, and take every measure possible to make sure you get the bath YOU want! With each of our baths you can choose to include a pop up waste system, LED lighting, inline heating system, front and side panels and Bluetooth audio system and you can upgrade to our luxury jet system.